As you get older, new oral challenges can impact the health of your teeth and gums. 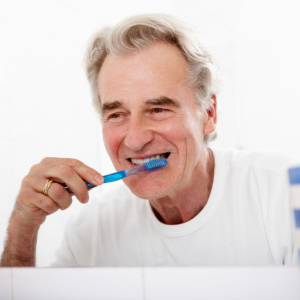 Aging presents new oral challenges, therefore maintaining good oral hygiene is critically important as we age. When problems occur in the mouth, they can cause difficulty chewing, swallowing, speaking and smiling — basic functions which can affect both physical and social well-being. Dry mouth: Dry mouth can result from physical changes within the body as it ages but can also be caused by medications. According to the American Dental Association, more than 400 commonly used medications can contribute to dry mouth, and dry mouth can increase the risk for oral disease. In fact, 30 percent of all tooth decay in older adults is caused by dry mouth, according to the Oral Cancer Foundation. Attrition: Otherwise known as simple wear and tear. Many years of chewing and grinding can take a toll on an aging set of teeth, and as enamel wears down, the risk for cavities increases. Gum disease: Gum disease is another major oral health issue faced by older people — and it’s presently the leading cause of tooth loss in adults. The disease is caused by plaque bacteria, which thrive in the sticky biofilm that clings to the surface of teeth when they aren’t properly cleaned. Poor-fitting dentures can make the problem worse, as can the presence of certain diseases, such as diabetes or cancer. Mouth cancer: Oral cancer is a concern at any age, but it’s seven times more likely to show up in a person over the age of 65 — and it causes more deaths in older Americans than skin cancer. Root decay: Often accompanied by gum disease, the roots of your teeth may become exposed as your gums recede, leading to an increased rate of decay as you age. Add fluoride: Switch to a fluoride toothpaste or incorporate a fluoride rinse into your daily routine. Avoid tobacco: Tobacco in any form has been linked to an increased risk of mouth and throat cancer, not to mention heart disease and other serious conditions. Chewing tobacco can even lead to more decay, as many tobacco formulations contain sugar. Drink more water: To decrease dry mouth, ask your doctor if you can substitute your medication for one that doesn’t produce dry mouth. If this is not a possible solution, then drink plenty of water, chew a sugar-free gum and avoid alcohol, which tends to dehydrate your body. Use mouthwash: When used with brushing and flossing, an antibacterial mouthwash can reduce the buildup of plaque. Contact FirstLight Home Care today to learn more about how our caregivers can provide stress-free solutions to ensuring your senior maintain good oral health. Check out our Facebook page this month as we discuss and share tips on senior oral health care and prevention.